Last week I kept making a joke that it was the last stretch in my twenties and I was going to live it up by eating terrible and then do some sort of repair the next week. Well, mission accomplished. The day after my birthday I woke up feeling amazing. I had one of the best birthdays and felt so loved. I knocked out some work and was anxious for the upcoming birthday party that one of my friends put together for that evening. The sweetest gift my friend Cami made me. Then it hit me. The stomach bug. Ya know, that 24 hour bug that feels a lot more like death than anything else? Yep. That one. While all of this sounds terrible, which it was, there were some really big blessings I saw during all of this. First of all, I’ll never crave chicken fried steak again. Big win there. But more importantly, I realized how blessed I am to have friends who come running to my side when I am at my very worst. Yes, it was awesome to have so much love poured into me on my birthday. Sweet cards, gifts and time with friends, but this is the part of friendship that really makes you appreciate the people God gave you. Jessie, a dear friend of mine, was my savior that night. She forfeited all of her evening plans (which happened to be my birthday party) and stayed by my side. She compiled the stomach bug essentials, kept a cold towel around my neck all evening and took care of my dogs. She made me a bed in my bathroom, cleaned the kitchen and even took out the trash filled with vomit. If she gets sick from this, you’ll know where to find me. The part that stuck with me though, was when I had my head in the toilet and she stopped to pray over me. How did I get so lucky to have someone like her as a friend? I had friends texting me left and right asking if I needed anything. To my embarrassment, they were all notified of the situation via the Facebook invite. My friend Sarah called in medicine for me, which after throwing up the first three pills, I was finally able to break one in half and hold it down. I’m positive that aided in my survival. All of this being said, I realized that plans don’t always go right. Sometimes you don’t get to wear that outfit you bought specifically for the event. You don’t get the attention you desired and that’s a good lesson in and of itself. Instead you get loyalty and love. You get prayed over and a chance to appreciate the taste of real food and water again. You wake up happy, simply doing nothing at all, but feeling great and healthy. You realize that present moments matter more than future plans, and it’s better to focus on those instead of looking forward to the moments that may never come to fruition. This may seem dramatic, but gosh, isn’t it true? We are so spoiled here in this country. A lot of people around the world would love the taste of chicken broth, even when they are healthy as an ox. 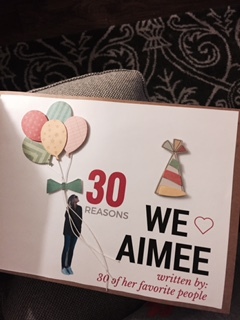 I was humbled by the love I received on my 30th birthday, during the good and not-so-good moments. And if I were to give you any advice I’ve learned since I turned 30 it would be…Wash your hands.